This is a sponsored post by NESTLE Coffee-mate. All reviews and opinions expressed in this post are unbiased and based on my personal view. 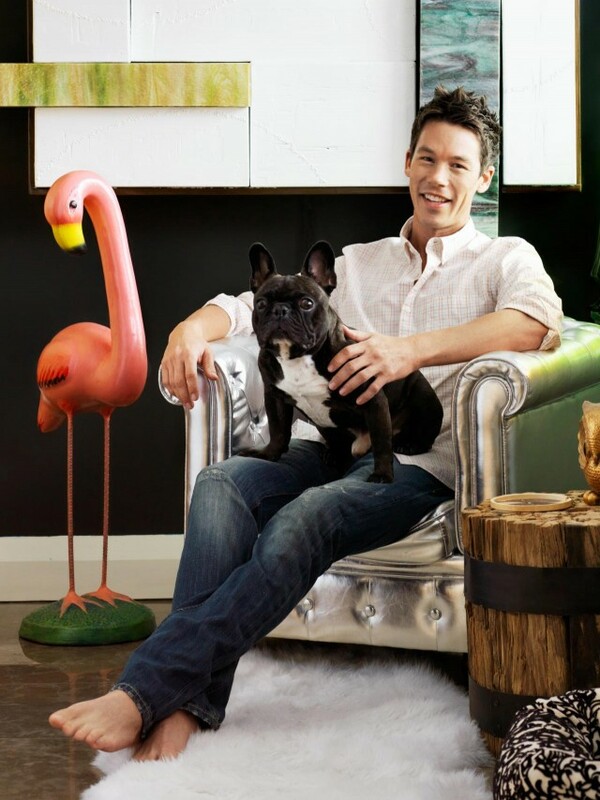 David Bromstad is an artist, designer, and HGTV host. He has also gotten into the world of product design. 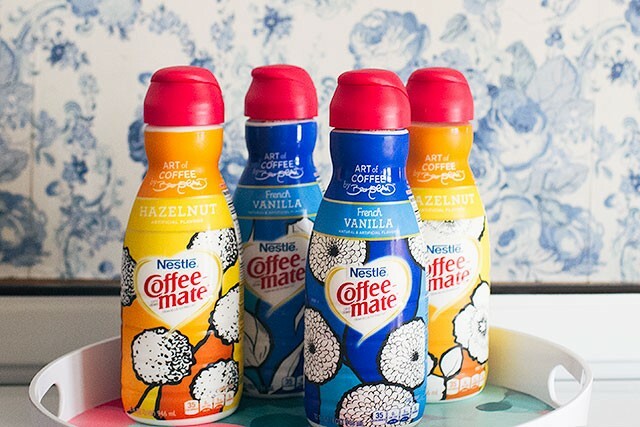 Last year, he made a pair of limited-edition labels for Coffee-mate’s French Vanilla and Hazelnut flavors, and now he has designed four new looks — two each for the same two varieties — available exclusively at Target. I was able to chat with David recently about his inspiration behind the designs, what a typical morning looked like for him, and how his home is shaping up these days. Plus we bonded over a mutual love of pink. “It’s just a happy color!” he says. This is Bromstad’s second collaboration with Coffee-mate, so I was curious about his inspiration and how he approached these new designs differently. He said that the first round was very painterly and artsy, on the contemporary side, but this time it was all inspired by his mom. When David was twenty years old and first started drinking coffee, he’d have the summers off, and he and his mom would walk around her garden together. She taught him everything about flowers and gardening, explaining the differences between perennials and annuals, showing him what would come back or die off. The art of gardening is just as much science, and he was fascinated by it. When it came time to create his new bottle designs, he recalled those summer mornings spent with a cup of coffee and the company of his mom, and that led him to the floral imagery he used. I’d seen Bromstad’s new home featured in an issue of HGTV Magazine recently, and it looked amazing but I remembered reading about his initial missteps in decorating it. 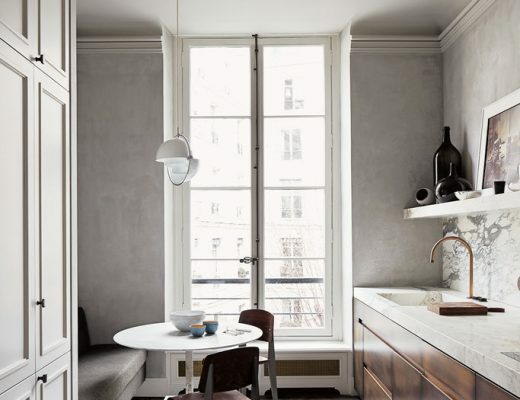 I’m always heartened to know that even the most experienced designers have trouble from time to time, especially since decorating and perfectionism had been on my mind when we spoke. I was curious about whether his home had continued to change, or if he considered it done. 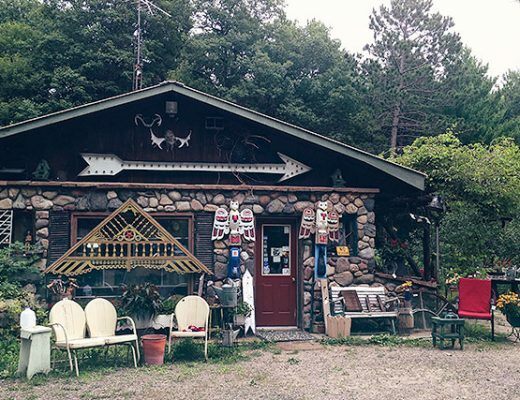 His home, as it appeared in the magazine feature, was a “very fun, poppy house. Very black and white, which is very cool.” It has completely changed since being photographed though, because of a new furniture collection he had been working on. It hasn’t been professionally shot again yet, but he sent some photos over that he had taken with his phone so we could get a peek into his home’s latest look. 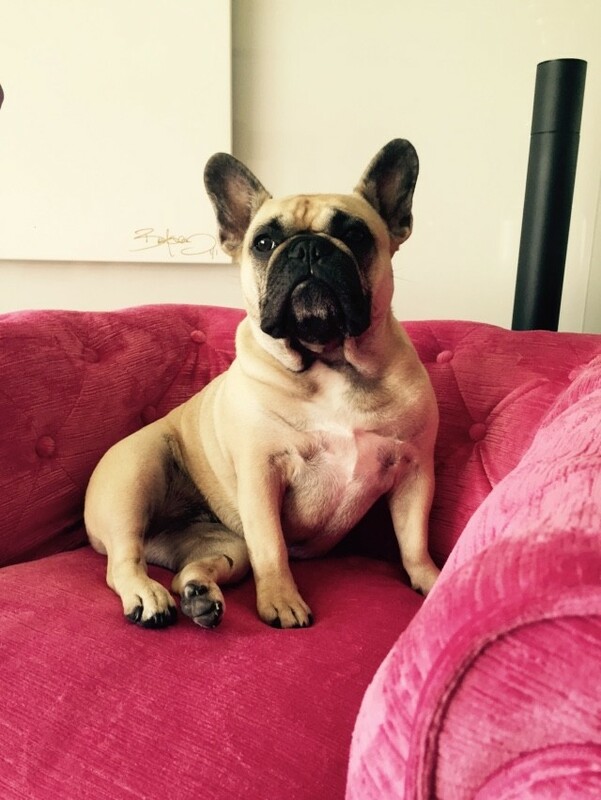 David describes his home as effervescent, saying that it’s soft, chic, and sophisticated, but with tons of color. It’s a little more mature, more his age now, and more ‘him.’ And he seems like a pretty reserved guy, don’t ‘ya think? I start my day with breakfast and a cup of coffee too, and chatting with David had me feeling inspired. I decided to break out my brushes, and I customized that tray you saw toward the top of the post. I’ll have more photos to share with you next week, but in the meantime, I’m thinking about trying my hand at another painting project. I was thinking about what I use every morning that could use a little sprucing up. Maybe a set of coffee mugs or a clock? I’ve got plenty of paint left — let me know what you’d like to see it used on! 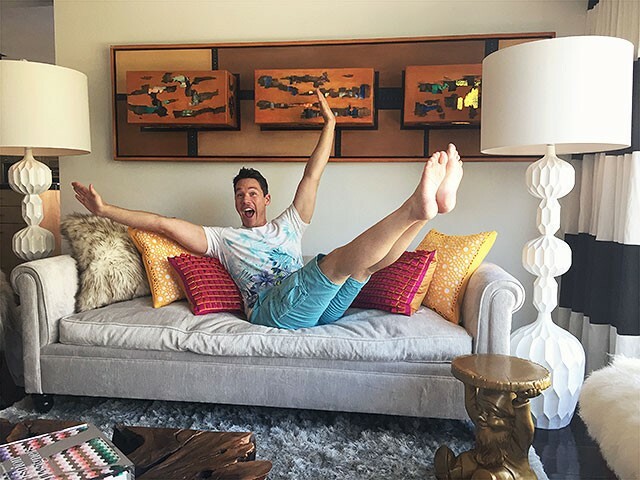 Love David Bromstad (and you)! Pink really is a happy color too. And I vote for a clock to paint. How would you wash a painted mug? Designer chemical creamer bottles? Maybe we Americans have too much time and money on our hands. Sorry – I normally don’t mind sponsored stuff, but this is just really reaching, Coffeemate. To me, these Coffeemate designs would have been fine with in-house graphic designers. I see nothing interesting or inspiring in either. And who uses Coffeemate anyway? I wish I knew how to make his money doing “designs” like that. I would leap in if this is what large companies want. You rarely miss but this post was a wild shot. I dont mind sponsored stuff and I do get that you are supporting your family with this blog but these days I think this is just going no where. I am sorry to say but you will be loosing your readers if you keep posting such kind of stuff. What kind of stuff? Interviews with other people? I don’t mind the tie-in, I like seeing David’s house and the interview. A woman dedicated to breastfeeding her child who agrees to shill for Nestle? You always seemed to be more thoughtful and certainly more careful about your good name. You sadden me and you perpetuate a suspicion I’ve harbored for awhile: design blogs are becoming nothing more than the online equivalent of tacky TV hucksters. I’m done. I’m sorry to hear that. This was a fun opportunity to talk to a designer I like, share a peek into his daily life, and I will have some DIY content to share next week. I didn’t look at this through a nursing/forumula-fed lens as I didn’t think it applied, but thank you for your perspective. I don’t understand the connection you’ve made, DDU, between breastfeeding and sponsoring a post with a Nestle product. If it is because Nestle makes formula and Nicole breastfeeds, then . . . I still don’t understand. Breastfeeding moms support formula moms and vice versa, isn’t that where civilized conversations are landing these days? I liked that this post was clearly labeled sponsored, had the obligatory product photo, but then continued on to focus largely on design and inspiration. Nicole shared David’s design process and mistakes with her readers. Now that’s a connection that makes sense: a design blog featuring a conversation about design. In response to Katie – I believe DDU was not trying to pin breastfeeding against formula feeding… I think she is referring to the Nestle controversy where they have been found to be unethically marketing their formula in 3rd world countries. You can google for more information but the gist is that they have spent decades promoting formula feeding in areas where clean water and other resources are hard to come by and causing hardships on newborns and their families. This controversy has been going on for decades. Another vote for a painted clock! I think it would be really cute. Amy, perhaps that is the connection ddu was trying to make. I was unaware of the marketing controversy. Thank you for informing me about that. I do stand by my comments, though, that breastfeeding moms and formula moms are on the same team. The fact that Nicole does or does not breastfeed is irrelevant to her sponsorship of a nestle product. Nestle has been appearing on a lot of blogs lately. Could they be trying to improve their image with bad publicity in California and here in Canada? I would suggest you look into some of their practices. While all interesting to read about a designer, I’m more disturbed that there is sponsorship of a company that provides products laden with aweful chemicals that are just wrong for consumption. Coffeemate is disgusting – the research is out there. Sad that we Americans don’t take the time to read labels and do our own research to understand the harm/burden to our society and health. From mothers to future children – not good. David’s beautiful talents surely could be manifested and recognized in other areas of the advertising world. I’ve read your blog for a long time, before E came along, and I’ve seen you grow with your business and family. It’s been very exciting, inspiring even, to see you become such a powerhouse in the blogging world. However, recently there seems to be a downturn in content – ranging from sporadic posting to what seems like forced sponsorship. I think I’d be fine with the lack of posts if when they came there was more meat to them. You’ve mentioned before feeling a renewed sense of creativity and energy, while I too was more of a fan of your last house, I’m hoping some of that old spirit can be channeled into this one. Meanwhile, please less sponsorship, or maybe ones that integrate more smoothly with your work. 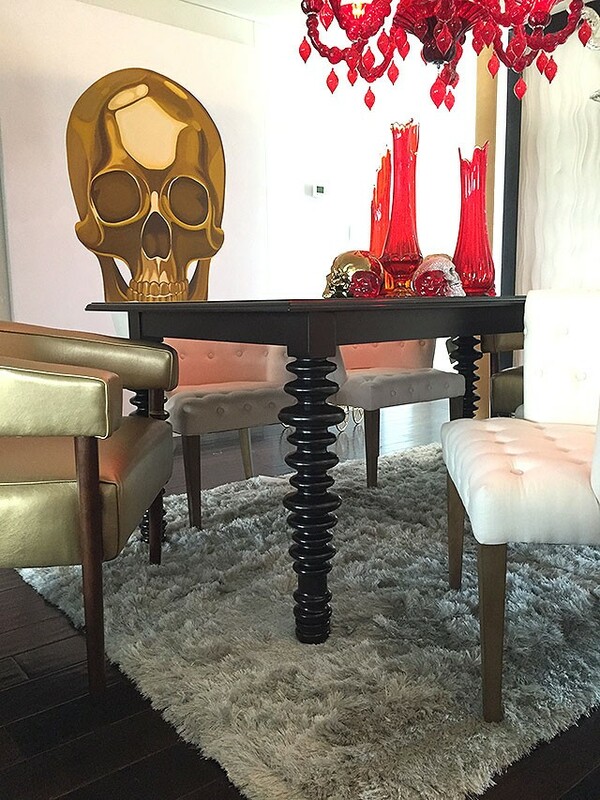 I think what makes me the most sad about this post is David Bromstad’s living room. He can’t be serious with that over-sheeped mess, can he? I have that sheep in my office! The kids come in and ride it as if they were in a mutton bustin’ contest. Also, when are you visiting California? I think a trip to the rose bowl flea market is in order. I’d have to agree… I don’t mind sponsored posts but Nestle…really? SO many questionable CSR policies. Also, to each their own but that guy’s living room looks just creepy… like a dead sheep shrine. I am seeing more and more blogs that I love and enjoy being hassled by comments critical of the bloggers content. If a guest came into my home and began giving me the benefit of their opinions on all of my tastes I would be astonished. With hundreds of bloggers one can find a writer that is agreeable and will submit to threats of fewer followers. I’m sorry if I am being offensive but the zeitgeist that seems to be the norm more and more is mildly mean or deliberately cruel and has an air of smug superiority about it. It just makes me want to cry and the persons who should hear from voters re: corporate malfeasance is your legislator because they are the only people who can force Big Business to act with integrity.